Have you ever met someone that always seems to win in life? Someone that has it together and leads the way for others to follow? Someone who always seems to exude a confidence and competence with everything they do? These individuals have learned what is called the “Slight Edge“. 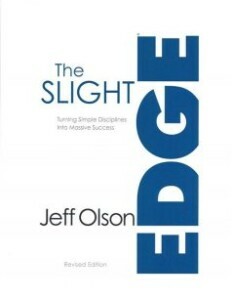 The Slight Edge, written by Jeff Olson, is one of my all time favorite books. One of the main points of the book is: Success is easy; but so is failure. What is great is that we have the freedom to choose which path to take. Success is a decision. Once we decide, It’s the little things we do over time that make the biggest difference in everything we do. True success requires personal and professional development. Unfortunately, reading one book or taking one or two sporadic leadership courses or seminars will not guarantee success. If it were that easy, there would be more successful people accomplishing more of their goals and dreams. When someone does fail, it’s because they did not apply the principles of success. One of the biggest problems is that most people judge their success or failure by the results they achieve. How can we judge something by the results, when the results come last? Failure is not the end result of an action, unless we allow it to be. Failure is simply a gauge of the actions taken and happens to be a necessary part of success. Unfortunately, giving up because of failure never leads to greatness or success in anything, from getting out of debt to starting a business. True sustainable success requires learning and adhering to the “Slight Edge principle“. The last 10% of your efforts account for 90% of your results. Most people only do just enough not to succeed. Learning and disciplining yourself to change your philosophy, attitude, and thinking will result in different actions and different results. That’s the hard part but it is just as easy to change as it is not to change. 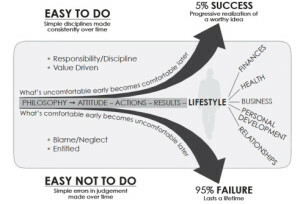 According to Jeff Olson and the Slight Edge principle, our philosophy is what determines our lifestyle. 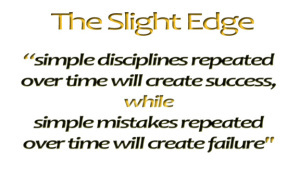 One of the great things about the slight edge philosophy is how it can be applied to any area of your life. It can help change some of the most important things that matter such as your health, finances, relationships and business success. It’s worth your time. “Success in any one of these areas begins to affect all the others too. Improve your health and you improve your relationships; work on your personal development and you have an impact on your career. Everything affects everything else”. The gift Mr Olson speaks of is the gift of Personal Development. The best thing you can do is start a leadership and personal development journey by learning the way busy adults learn. Little bits of disciplined learning over time. The main reason I promote leadership and personal development is because of the positive changes I’ve experienced in my own life as a result of “The Slight Edge” principle. When you strive for excellence, learn the right information and apply it over time, success occurs. Imagine learning the right information about your finances and getting out of debt or learning how to be a better parent or spouse. The benefits of committing to long term, life time growth, is priceless. All it takes is a catalyst and a willingness to improve your life. I learned that there are no short cuts to success. Long term results are what matter. How did I achieve results? By reading at least 15 minutes a day, listening to 2-5 audio cd’s in between, and hanging around positive like minded people who encourage others to succeed. No matter how much you have it together, learning and growing is essential to having a better life. Those successful people I mentioned in the beginning all have one thing in common. They apply the Slight Edge and continue to make the best investment possible- In their brains! If you apply the “Slight Edge” principles and make a commitment to personal growth and learning leadership skills, you will be amazed at what you can accomplish!